I want to at least double design size from 6in to 6in to about 12in by 12in. I am using a raster program and ttf fonts which the max size is 2000 pt = 6in by 6in. Can it be done in the raster program without losing too much quality -using it for print on demand products such as t-shirts. I tried a vector program, but it did not work. Create a new blank image, and set your canvas size to 12" x 12" at 300 ppi. This will create an image size which is 3600px x 3600px. 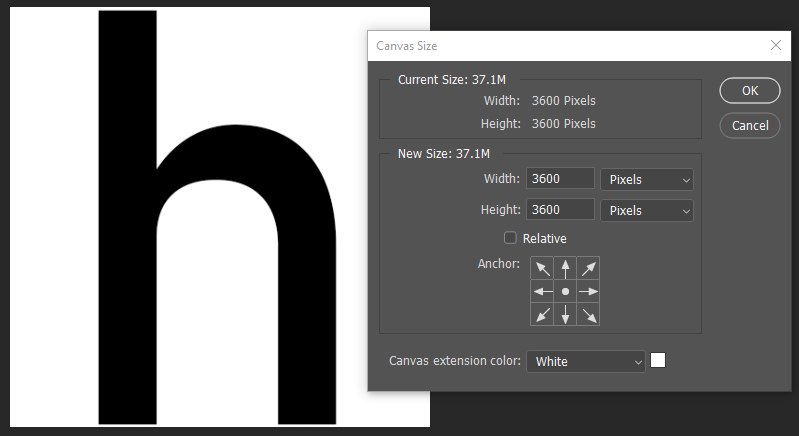 A font at 1200pt will fill the canvas. There's no need to go up to 2000pt at all. Since you have the font already, just retype the letter. Here's what it looks like in Photoshop below. I also tested this in GIMP which is free, with the same result. So, you're good to go! No need to resize anything!! And BTW, if you are screen printing, then 300ppi is probably excessive. Check with your screen printer what resolution you need. I suspect 150ppi would be absolutely adequate for most fabrics. Actually you do not lose quality when you scale the pixel resolution upwards. You only see how bad it is in bigger size. You can keep sharp edges sharp, thin lines thin and avoid increasing jagginess if you use a smart image resizer. There are several of them as commercial and freeware. They try to guess where are something which is intended to stay sharp. They do not invent new details, but they easily keep apparent sharpness much better than normal upscale by resampling tools which we meet in Photoshop, GIMP and other raster image editors. I have tried Smilla Enlarger (freeware) and On1 Resize. Both of then seem to work as promised. Even some screen resolution images are printed succesfully after enlargening them to 400%. Fortunately they weren't those typical ultra-noisy hobby photos taken with a bad smartphone camera in low light. Warning: It's no use to try to enlarge noisy JPGs. The noise, which often is compression artefacts, is also enlargened. Not the answer you're looking for? Browse other questions tagged fonts resize raster or ask your own question. I need to resize some digital artwork made in PS for print…? What am I missing if I have a font created from SVGs using some online application?